Choosing flooring for your home? If you like the look of wooden floors, but real wood doesn't suit your budget, laminate makes for a smart and durable alternative. 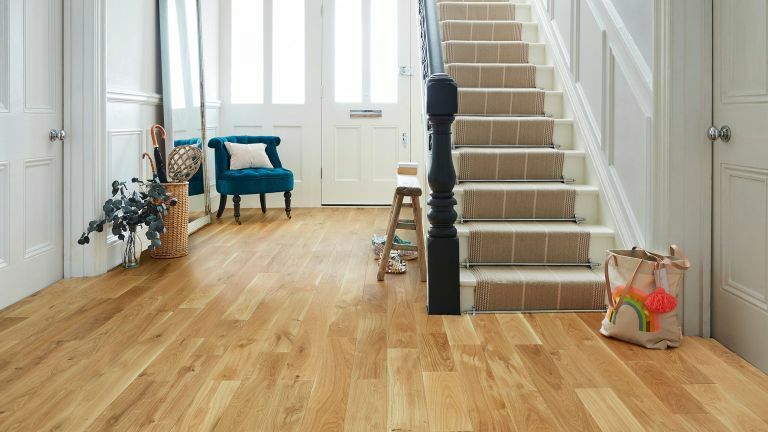 With so many options available, we'd recommend reading our guide to choosing laminate flooring to ensure that you make the right choice for your home. Providing advice and guidance, expert renovator Michael Holmes talks us through the process of laying laminate anywhere from your kitchen to your bathroom. If you're a keen DIYer, this is a great way of cutting even more costs. Laminate flooring is inexpensive, costing as little as £4-£6 per m². If you want a real wood finish, buy pre-finished engineered timber boards for £13-£15 per m² or plywood for £10m². As a general rule, when it comes to laminate flooring you get what you pay for. First, remove any existing skirting boards, or use a door trimmer to cut a slot at the bottom of the skirting to create room for an expansion gap around your new flooring – with a trimmer you’ll only have to remove skirting on the wall where you’ll be fitting the last row of boards. Doors can be trimmed in situ to avoid having to remove and rehang them. Trim to allow for the depth of the new flooring, plus an 18mm plywood layer, 3mm underlay and 1-2mm tolerance for the slot. Fit a scotia cover strip at the end if you don’t want to trim and remove skirting. Are you laying over a timber floor? If laying over a timber floor, fix down all boards and countersink nail heads. Replace damaged or missing boards and fill major gaps before laying the laminate. It’s worth sanding the floor level, using coarse grade sandpaper. If there are small changes in level between rooms, build them up to level; or have a seam and cover with a matching threshold strip where the rooms join. Are you laying over a concrete floor? If laying over a concrete floor, you need to grind it down to remove bumps or high points, or build up dips using a self-levelling latex screed. It’s worth fixing a layer of 18mm plywood, glued and nailed down (use masonry nails for concrete). Fit a plastic damp-proof course over any concrete screed beneath the plywood. Choose which way you want the boards to run, usually in the direction the light shines into the room or that of the longest wall. It will take a day to prepare and level the floor plus a day to lay the laminate flooring in an average size living room. Set the boards out before laying to avoid narrow cuts at doorways. Make sure the threshold between different floor finishes (e.g. laminate and carpet) is directly beneath the door, so you can only see one floor finish in each room when the door is closed. Start with a prominently visible board in the centre and work outward as most rooms aren’t square. Lay from left to right, with the tongue facing the wall. Use offcuts to start the next row to stagger the joints. For a neat finish around radiator pipes, clamp two boards end on end on a piece of scrap timber and mark the pipe position centred on the join. Then drill out, leaving room for expansion. Separate and lay around the pipe. Laying laminate or engineered wood flooring with tongue-and-groove edges involves much the same process, with the boards laid over a felt underlay as a floating floor, fixed only to each other (either glued or using a clip fix system). Cheaper boards are only 7-10mm thick, so the key to a good finish is a level and solid substrate, otherwise the edges won’t fit flush. Fit the last row (which will be tight against the wall) as one piece by joining the planks’ short end to end and then sliding them into place, starting at a 45° angle. Looking for more laminate flooring tips and tricks?